We often overlook fermented vegetables as a rich source of good bacteria. Lately there’s been a lot of buzz about the health benefits of probiotics, which are live bacteria that aid in digestion and contain a dizzying array of other health benefits. We usually think of bacteria as something bad, but research shows that gut bacteria are a good thing, the more diverse the better. You may be most familiar with these healthy bacteria as live cultures in yogurt or kefir. Kimchi and sauerkraut are perhaps the best known vegetable sources of probiotics. But store bought versions may contain excessive amounts of salt which can contribute to high blood pressure. 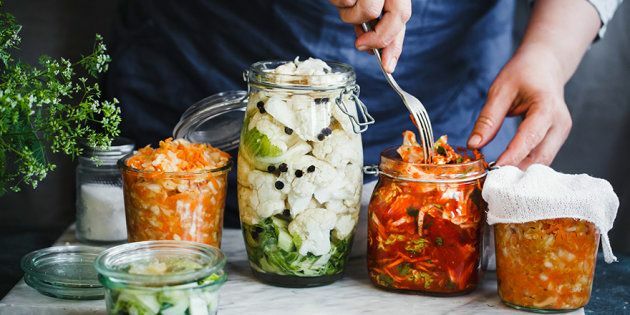 Why not experiment with making your own pickled or fermented vegetables this summer so that you can make a truly healthful version? We often overlook fermented vegetables as a rich source of good bacteria. What happens during the fermentation process is that natural bacteria feed on sugar and starch to create lactic acid. That acid both preserves the nutrients and creates beneficial enzymes and probiotics, which allows our bodies to absorb more nutrients. In the old days, fermentation was used primarily as a way to preserve food. Today our motivation has shifted to the pickling process as a gateway to enjoying better health. Studies demonstrate that eating foods that contain probiotics have benefits for both our bodies and our brains. These industrious bacteria can treat diarrhea and ulcerative colitis, boost the immune system and may even help prevent breast cancer. Probiotics are also effective in treating mental illness. A multitude of studies prove the effectiveness in probiotics in treating anxiety and managing depression. It’s not difficult to incorporate fermented foods into your diet. Whip up a flavoursome appetizer by stuffing a mushroom cap with sauerkraut, sprinkled breadcrumbs and parmesan cheese or mix kimchi with roasted vegetables and potatoes and enjoy a variety of different tastes and textures. Serve cut-up veggies with a probiotic rich kefir dip made with minced dill, crushed garlic and lemon juice. Fermented vegetables will spice up any breakfast scramble, lunch wrap, or even elevate a pedestrian grilled cheese sandwich to gourmet standards. One cup of sauerkraut, for example, contains just 26 calories and 2 grams of fiber. Like other cruciferous vegetables, such as radishes, broccoli and kale, it contains vitamin A, C and K and is an important source of minerals such as iron, manganese, copper and calcium. A cup of kimchi, a spicy pickled cabbage, is just 22 calories and has a long list of health benefits, including brain, skin and colorectal health promotion and cholesterol reduction. One of the advantages of doing your own fermenting is that you can control the sodium content. Salt serves many purposes in the fermentation process. Not only does it keep unwanted bacteria from propagating, it also adds flavour, preserves vitamins and preserves the crunch. Chemically, the addition of salt slows the fermentation process, thus allowing the flavours to fully blossom. Chef Matthew Jennings, Executive Chef and Owner of Boston’s Townsman Restaurantand three time James Beard Foundation Award nominee, offers a step-by-step guide to pickling your own vegetables. Here’s his advice on which vegetables, spices, and pickling solutions work well. Carrots, radishes, turnips, beets, okra, green beans, cabbage, red onion, zucchini and summer squash, sliced cucumbers, asparagus spears, cauliflower florets, bell peppers and fennel bulbs. Coriander seeds, whole all-spice berries, whole peppercorns, sliced garlic cloves, dill seed, chili flakes, dill sprigs and bay leaves. Distilled white, red wine, rice wine and apple cider. Note: If you’re keeping an eye on your sodium intake, watch out for sauerkraut’s high sodium levels. A 1/2 cup of some store-bought versions of sauerkraut contain almost 500 milligrams of sodium. The daily recommended intake of sodium is 1,500 milligrams a day. Organic food broker, wholesaler for certain food lines and producer of our own brands of organic maple syrup and unpasteurized sauerkraut. Beland Organic Foods is a distributor and wholesaler of organic Karthein’s Sauerkraut & Kimchi which are unpasteurized products and contain naturally occuring digestive enzymes and beneficial probiotic bacteria. Find out more.